Short game SEO is as inefficient as corporate board room meetings where plans are only made for maximizing profits in the next quarter. Much of the time, the things that may equal big short term gains are not good for the long term. This forces everyone involved to play a constant game of "Now what?" every month or every quarter when the previous plan runs out of steam. The other big shortcoming of old school SEO is that it only focuses on traffic. Rank higher. Get more traffic. Mission accomplished. That mission may be accomplished, but it was the wrong mission. Businesses aren't shelling out money each month simply for bigger Google Analytics graphs. They want more customers, and they want to solve real marketing challenges. To really address these goals, the SEO strategy has to come down to design as well. This is the main reason we prefer to do SEO work with companies for which we've also built their site. A company with an outdated site that isn't built to convert customers or even send the right message fights with one arm tight behind its back when it comes to SEO. That kind of campaign simply won't get the results the business is looking for. Okay, so what does long-game SEO look like? Long game SEO involves design thinking. That is, using both research and a brand's intuition to focus the look of the website as well as its messaging. A lot of traditional marketing is taking an existing product or set of materials and saying "How can we sell this to people?" In websites, that often translates to building a design that "looks cool" and then trying to tweak it to convert customers. Instead, the whole design process should center on speaking the brand's message. What is it that this company's customers like about the products? Do they buy from this company in particular because of a way the company and its products make them feel? Probably. Most likely even. Everything about the website should fall in line with this. Ranking for keywords is an important piece, but it's only a piece. Some SEOs try so hard to rank for Google they forget about the human element of the website, which at the end of the day is the most important. Even a million site visits per month is useless if nobody reads the content and nobody takes an action other than hitting their 'back' buttons. Basic copywriting involves selling benefits and features. But people don't buy because of features. We all make buying choices because of emotion and justify the decision with logic after the fact. What does your website do to convey that emotional buy-in? Is the copy bland "Here's what we do" filler or does it speak to WHY your company does what it does? 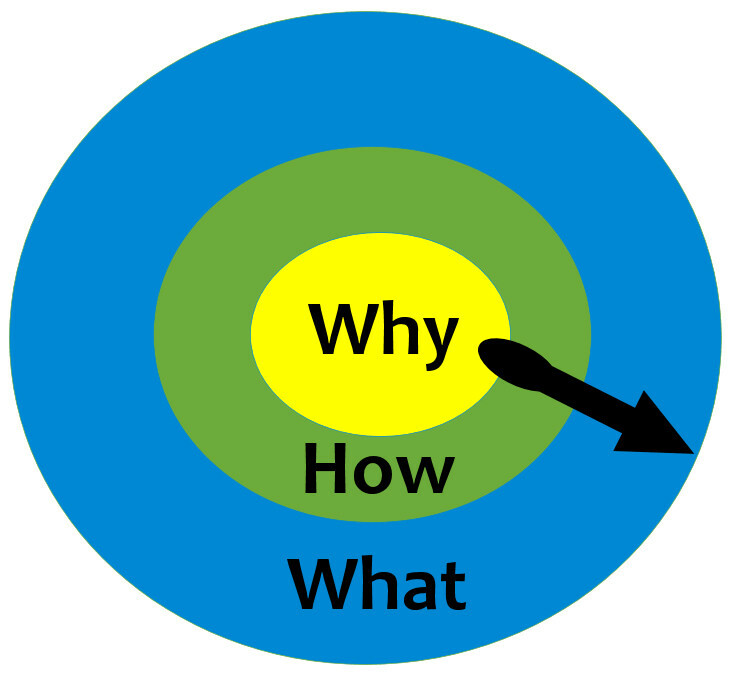 Simon Sinek gives a great Tedx talk on the Golden Circle and why the strongest brands begin with WHY and work outward toward HOW and WHAT in their marketing. Every part of the website should work toward a clear goal. Strong websites aren't haphazardly thrown together. The way the logo is displayed, the placement and look of the main navigation menu, how much text there is on the main page and what it even says... these are all deliberate. On each page of a website there is one question that needs to be answered: What do we want visitors to do, ultimately? The design itself should guide visitors toward that action. If the goal is to get people to sign up for your newsletter, for example, design elements should subtly nudge people toward an opt-in form. So should the copy. There can be numerous calls to action, but each of them needs to be guiding the same action. When there are numerous choices it's confusing and damages that conversion factor. You can't simultaneously push people to call you for a quote and also sign up for your newsletter and also leave your business a review. It's too much, and the visitor will probably end up doing none of those things. Instead, decide which is most important and focus only on that. The presence of this sort of plan is a sign that a web design firm "gets it". This nuance separates an adequate website from a strong one. Traditional SEO obviously involves tracking keyword ranking, but again that only deals with traffic. To make the most of its efforts, a business also needs to track those conversions across the site. Take those goals we discussed above for each page and use advanced Analytics and other tools to learn how many visitors are doing that action. Tracking this percentage allows for ongoing adjustments. Improving conversion through design doesn't have to mean a complete overhaul, though. Conversion studies show consistently that small changes can often have big effects. Sometimes the reason your page isn't persuading visitors to commit to an action comes down to subtle things like the title or even the color of buttons used. There's something about your operation that does encourage people to follow your newsletter but doesn't get them excited to leave a review after they've worked with you. If it's #1 a little more research and adjustment may do the trick. #2 happens, and though it's a much more complicated solution it's very useful to be aware of. That's either a customer service or a work culture issue. "Your website needs to be mobile friendly!" This isn't new advice at this point, but as we've mentioned before there's a difference between simply making a site that is technically responsive and building a site optimized for a great mobile experience. A responsive design condenses and rearranges the information to work on a mobile screen, but it doesn't necessarily make specific choices about what to show or omit. If you have a slider with text overlay on the desktop version of the site, replacing the slider with a static image and larger text is probably better than a scaled-down slider image with unreadably small text. Images that normally align left or right may be wide enough to center in the page rather than try to fit alongside text on mobile. Is the site set up to do that? These little examples of attention to detail make the difference. A site might otherwise look great, but having discord in small design elements can be jarring. A reader who was otherwise in a relaxed, flow state while exploring is now distracted by hard to read text or poorly arranged elements. Whatever point your copy was trying to make a second ago is now hampered. Aside the messaging aspect of branding, aside the on-site content, and aside the site design, it's an SEO's job to point out other road blocks to a client's ranking success. Slow hosting, inefficient code, or even bad habits in staff updates can also contribute to the road blocks to ranking success. Some SEOs are afraid to bring these things up, seeing their role as simply doing research and creating content. "They didn't ask for my opinion about their hosting or how their staff does things," they might say. "They might be offended if I overstep." But an SEO's value to the client is greater with this whole-picture view. What a modern business needs most is to tell their story honestly and impactfully; and they're paying for that 'win' rather than a few simple tools and some charts and graphs. A successful long-term SEO campaign improve's the perception customers have of the client company. It boosts their exposure to the right kinds of customers, and adds to the business' bottom line without also adding unnecessary fluff. SEO involves far more than some keyword research and adding some new content each month. Those are important parts, but the real job of an SEO firm is to take a high-level view of the business and remove as many obstacles as possible. It doesn't refer to any one tool, but rather a collection of them. It's a view that is more concerned with long term success than quick and fleeting gains, the momentum of which can be game-changing as it builds.